In today’s fast-paced, technology-driven society, teaching children manners is something that is more crucial than ever. One of the most important jobs we have as parents is to help our children develop social skills, show them how to interact in a polite manner with people, and teach them to treat others with respect. Whether the occasion is a holiday gathering, a family meal, or a simple trip to the grocery store, parents can use these social opportunities to instill good manners in their children that will become a habitual part of their lives into adolescence and beyond. Here are some great ways parents can teach their children good manners. These are a few manners all kids should know. Teach them to say “Please” and “Thank you”: This, of course, is one of the cardinal foundations of good manners. As kids get older, parents can encourage them to write thank you notes, preferably with pen and paper. It goes without saying that kids should learn how to say thank you for gifts that they receive; but they should also be taught to say thank you to people who assist or serve them, such as waiters in restaurants, and even their mom and dad when they do something for them in the course of their daily routines. Don’t forget the cousins: The cousins of “Please” and “Thank you,” that is. Be sure to teach your child to use phrases such as “May I,” “Fine, thank you; and how are you?” says Patricia Rossi, author of Everyday Etiquette. Practice greeting people properly: Showing your child how to greet people properly is one of the most important skills you can teach him, says Rossi. Teach your child to look people in the eye, face them directly, and shake their hand when meeting them. A great way to practice these skills is by going over them with your child while role-playing. Encourage your child to use “Mr.” or “Ms.”: It may sound old-fashioned, but using a title and last name is really the most well-mannered way for a child to address or refer to someone, says Rossi. Go over how they should answer the telephone: When answering the telephone, teach your child to say, “May I tell my mother who is calling, please?” instead of saying “Who is this?” says Rossi. And for safety’s sake, tell your child not to say your family’s name when answering the phone (as in, “Smith residence”). Also, remind your child to never scream across the house for you but to walk over to you and tell you that you have a phone call. If you are unavailable, teach your child to say something like, “She’s not available. May I take a message, please?” And tell your child to take down the information, repeat it back to the caller, and ask the caller how her name is spelled. Emphasize cell phone etiquette: If your child has a cell phone, be sure you convey the message that it will not be brought to the table. (In fact, you may want to consider banning all electronics at the table and turning off the TV so that you can focus on each other and the dinner conversation.) Rossi suggests having your child place her cell phone in a basket when she walks in the door. Remind your child to speak to people in a way he wants to be spoken to: That means not using use rude remarks such as “Shut up,” or speaking in an unfriendly tone of voice, even when disagreeing with someone. Get your child into the habit of waiting for her turn to speak: This is one a lot of children, especially younger kids, have trouble with. That’s because often, kids want to express their thoughts as soon as something occurs to them. Children are also naturally self-centered and may need reminders to wait until someone has finished speaking before interrupting. To help kids learn this habit, parents can try using a visual reminder, such as a stuffed animal or a talking stick. Simply have everyone talk only when it’s their turn to hold the talking stick to teach kids how to wait for their turn to speak. Emphasize the importance of being gracious when competing: Teach your child not to gloat when winning and to cheer others on when he is losing. Good sportsmanship will be an important skill for children to have later in life when they need to work with others on projects and other endeavors at home and at work. Teach your child good playdate manners: Remind your child to follow the rules of her friend’s house when on a play date, and to always clean up after herself before leaving. Be sure your child always greets the host or hostess, never puts her feet on the furniture, and waits until the host eats first at snack time. Also, stress the importance of using a “library voice” inside the house. If your child is hosting the play date, be sure that she puts her friend first, by, say giving her the best seat and serving her first, says Rossi. 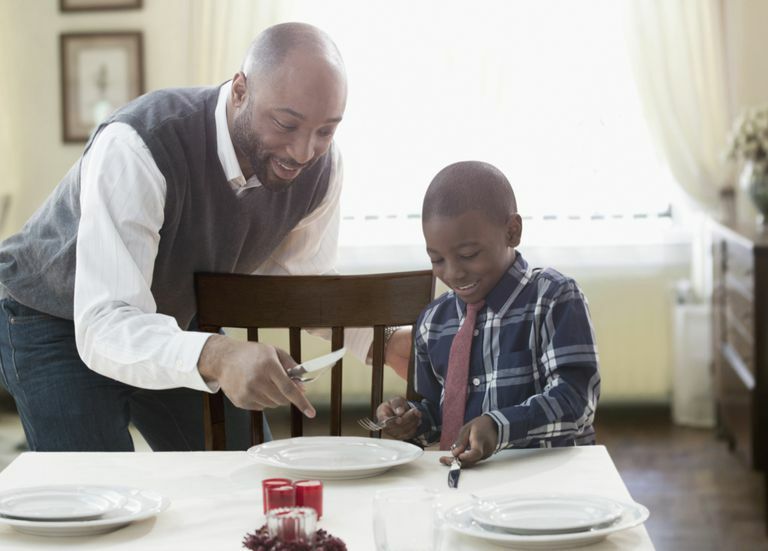 Instill good table manners in your child: No matter whether it’s a big holiday meal with family or an ordinary dinner during the week, your child should have a good handle on basic table manners. Basic good manners such as not chewing with one’s mouth full or waiting to eat until everyone has been served can be followed by even the youngest of grade-schoolers. And as children become older, they can help set and clear the table and carry on a pleasant dinner conversation. Given that we see bad behavior everywhere around us, what can we do as parents to make sure that our children adopt good manners and treat others with courtesy and respect? Here are some manners many kids today are lacking (along with the skills that are related to them) and what parents can do to instill them in their children. Engaging with the person next to them instead of staring at a screen: This behavior is so common among adults and children alike that there's a term for it: phubbing, or phone snubbing. Kids today are often using tech media devices, and keep right on using them when they are with friends or grownups. Greeting people properly/having a conversation: Many children today do not practice basic good manners when meeting or speaking with others. Good etiquette means looking the other person in the eye when saying hello and speaking to them, listening to what they are saying, responding to questions, and waiting your turn to speak—skills that many children are sorely lacking today. Saying “thank you” and “please”: It’s a sad fact that many children today are shockingly rude when out in a restaurant or other setting where someone serves them or helps them. Even kids as young as age 3 and 4 should be routinely reminded to say thanks, but it's all too common to see kids of all ages—including older kids who shouldn't need reminders—lack these basic manners. Opening doors/holding doors for other people: Does your child see someone struggling with a stroller and bags and notice that she may need help opening a door? Would he observe an elderly person struggling with a big bag and ask if she needs help? If the answer is no, it's time to redirect your child's thinking. Writing thank you cards: This is something that has become much less common since we all started using email and texting. And while sending an email or text to express gratitude is good, actually sitting down to write a physical note to express gratitude for a gift or a favor is even better. Here are some ways you can guide your child toward good etiquette to alleviate these specific manners they're lacking. Have dinner conversations: Not only are regular family dinners important for kids’ health and development (they’ve been linked to reduced risk of obesity, healthier eating habits, improved social and emotional skills, better school performance, and more), they can be excellent opportunities to have kids practice how they should speak to others and how to have a conversation (listen, wait for a turn to speak, disagree respectfully, etc.). Have kids regularly say “thank you” and “please": Whether at home or in a restaurant, get your kids into the habit of saying thanks when someone serves them food, helps them with something, gives them a present, or does something else for them. Teach your child to always be respectful to waiters and waitresses, taxi drivers, and anyone else who serves them. Have them write thank you cards: A proper thank you card will express why your child appreciates a certain gift or favor, and include some acknowledgment about the specific gift. Turn off the TV: Pundits talking over each other and hurling insults are common on news programs, not to mention the “sassy” attitude you often see on many kids’ shows. (Really sit down and watch some episodes of your kids' TV shows sometime; you may be shocked by the amount of backtalk and rudeness you see in the way characters interact with one another, not to mention the amount of violence, even in shows rated appropriate for young kids). Reducing screen time is a great idea in general; research shows that cutting back screen time improves kids' health, grades, and behavior, among other benefits. Show them how to write polite emails and texts: Your child will communicate via email more frequently as she gets older. Go over some basics with your child, such as how to greet someone in an email, how to write in a clear and polite tone, and how to sign off at the end of the email (with “Sincerely,” or “Yours Truly,” or “Best,”). If you have allowed your older school-age child to have access to social media, be sure he never posts rude comments. Work on ways to limit cell phone use and other electronic devices: There are benefits to limiting screens that go beyond building better manners. Teach her the importance of empathy: Get your child into the habit of noticing those who might be in need (someone struggling with a door or a heavy bag, for instance). Teach her to think beyond her own needs and think about how she can assist someone who might need a helping hand. Set a good example: Your child will, of course, learn by watching you, so really take a good look at your own behavior. Do you say thanks when someone does something for you? Do you speak respectfully to your children and to others around you? Do you treat family, friends, and even strangers with courtesy and respect? Evaluate your own manners and conduct and make adjustments if necessary so that your child can use you as a role model to follow as he learns how to properly interact with people. Finally, remember that you set the standard. If you are at the dinner table texting on your cell phone or routinely speak to people in a rude manner, your child will pick up on these behaviors and will most likely copy them. If you want to raise and well-mannered child, the first thing you must do as a parent takes a good look at your own behavior and make sure you are consistently practicing good manners yourself.